Everyone deserves to spoil themselves every once in a while—you included! There are many ways to spoil yourself. It all depends on what you consider to be a treat. Try spoiling yourself by planning a whole day of fun or relaxing activities. You might also spoil yourself by starting a self-care practice or buying yourself something special. Decide which way you want to spoil yourself and have fun! 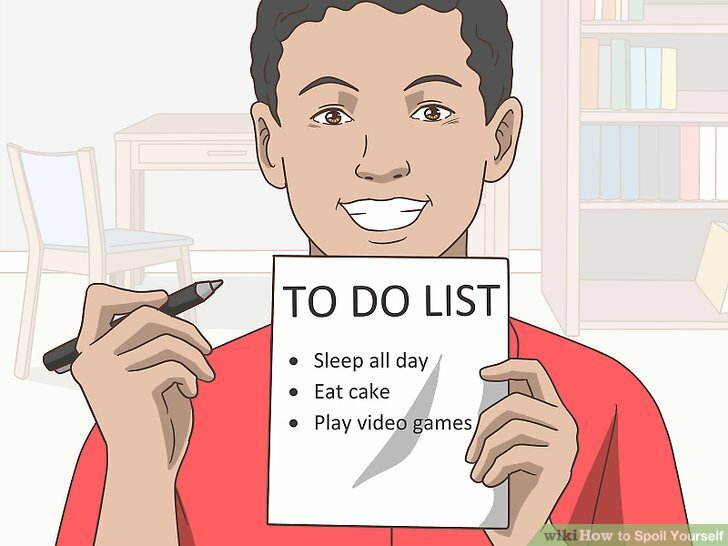 Make a list of activities you want to do. To make sure you spend your special day doing all the fun stuff you like to do, make a list. Just once, forget about chores or obligations for the day. Write down all the activities that brighten your mood. You may even add some interesting activities you have wanted to try. Plan your special day on a national holiday, on a weekend, or you can use a vacation day to spoil yourself. Sleep in, if you like. 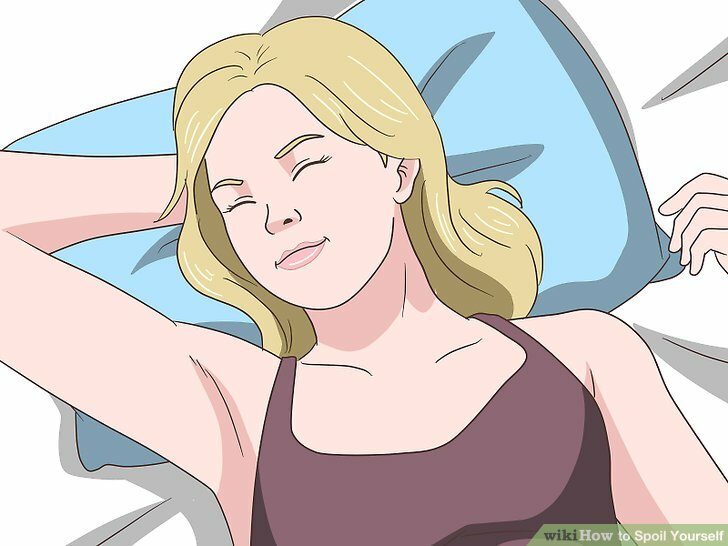 If you typically have to rise early, treat yourself by having a lie-in. Set your alarm for a little later than usual. Don’t stress about it—it’s your day, remember? Once you wake, don’t feel rushed to take on the day. You can bring a book or magazine back to bed, cuddle with your partner or pet, or simply just enjoy the comfort of the sheets. 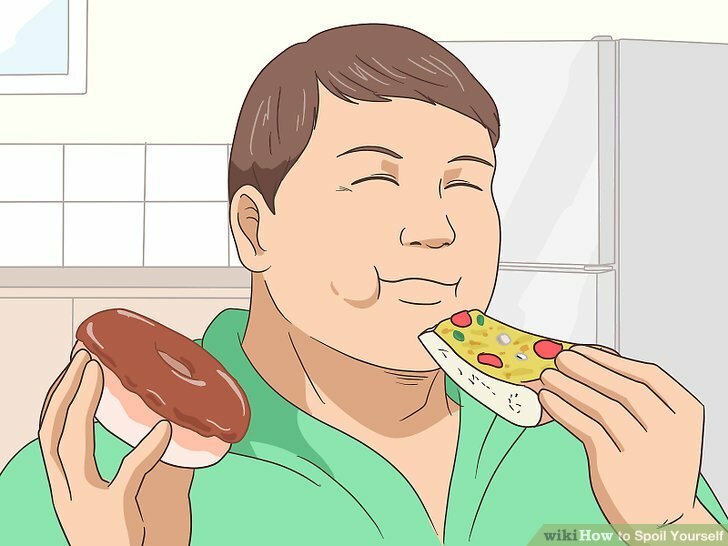 Think about the yummy foods you have been craving. Choose one or two delicious meals to cook for yourself or order out. Only cook if you actually like cooking. Otherwise, that falls under the chore category, and you’re skipping those for the day. In addition to your basic breakfast, lunch, and dinner, choose tasty snacks or desserts that you like. Try to keep it balanced. You’ll be low on energy and unable to enjoy your day, if you only eat fried or sugary processed foods. Do your favorite activities, alone or with your loved ones. Take your list of activities and start moving down the list. 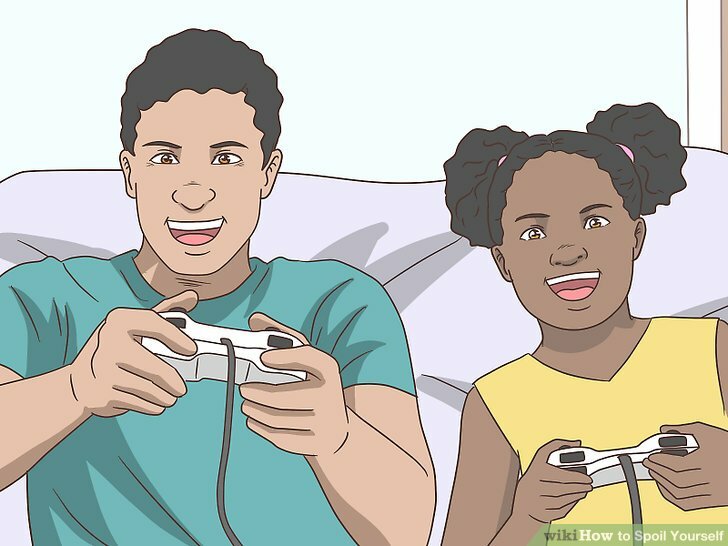 You can do these activities on your own, or you can ask a buddy to join you. Keep in mind that others may try to influence your plans, so if you really want to spoil yourself, go solo. This day is supposed to be about you. You might see a movie at a local theatre, go for a swim, feed the ducks at the pond, ride your bike, or binge-watch your favorite TV show. After a long, satisfying day doing all your favorite activities, you should probably turn in early. That way, you’ll wake energized and ready to take on your usual responsibilities. Plus, getting seven to nine hours of sleep will ensure that you have a positive mood. Close the drapes, dim the lights, and lower the temperature so that you can sleep more comfortably. Take a warm, pampering bath. If you’re typically a shower-and-go sort of person, you can treat yourself with a long, relaxing bath. Alert your roommate or family not to disturb you. Light a scented candle. Add bath salts, oils, bath bombs, or bubbles to the water to enhance the experience. Bring a book or your tablet along so that you can read or watch a show. Or, turn on some music and simply relax. Snuggle in a blanket with a cup of tea. Wrapping yourself in a soft, cuddly fabric is like a long-drawn-out hug. Adding a cup of tea only increases the feeling of warmth. Plus, many teas offer health benefits. Choose exotic flavors or simply reach for a classic blend that you prefer. Doing this for yourself is like a physical representation of self-love. 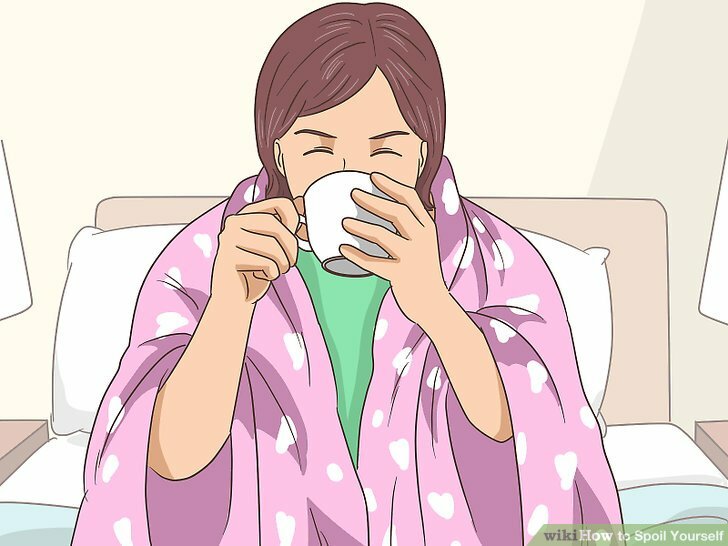 The warmth of the blanket and the tea can ease stress and calm you down after a long day. If you want, ask someone to join you, like your partner, parent, or your pet. 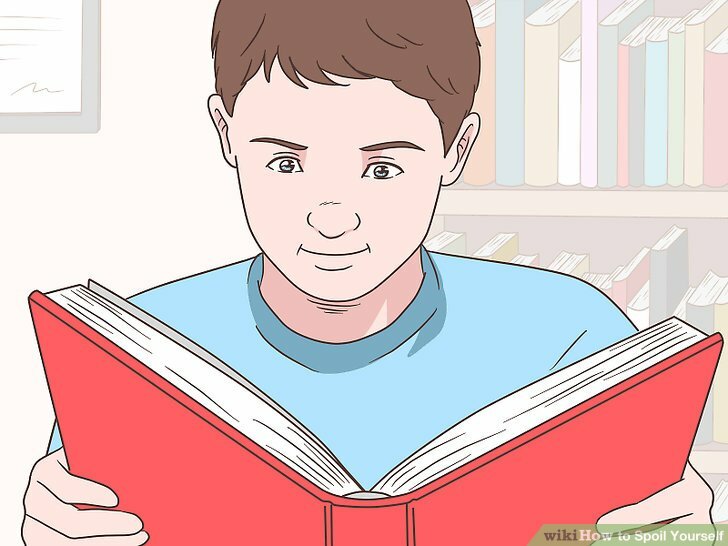 Reading has many benefits from teaching you about different cultures to expanding your vocabulary. But, best of all, it provides an escape from everyday life. Choose a book that you already own or check one out from your local library. Find a comfy place to sit and get lost in another world, or learn some interesting facts. The ultimate way to spoil yourself with self-care is by eating foods that support your health. It’s nice to indulge in comfort foods and sweet treats, but these choices won’t actually make you feel good about yourself. 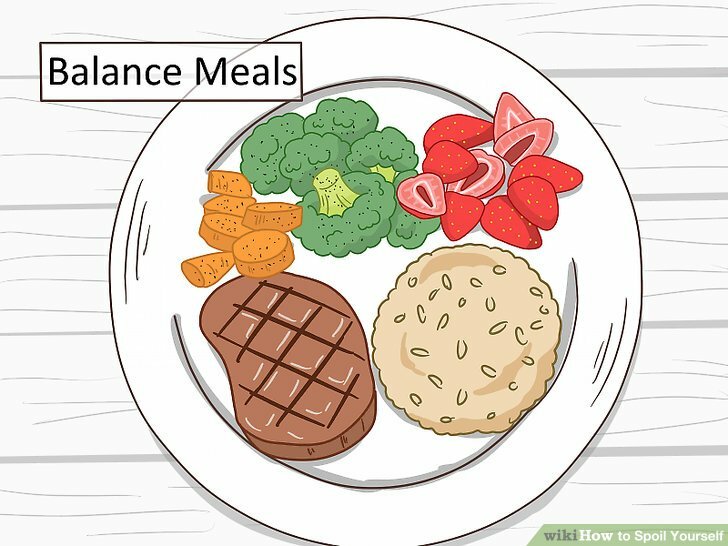 Healthy, balanced meals can provide energy and make you feel positive because you made a healthy choice. Eat a nutrient-dense meal with vegetables, fruit, whole grains, lean sources of protein, and healthy fats. Drink plenty of water to stay hydrated. For example, you might treat yourself to a steak, but serve it with roasted veggies instead of greasy French fries. Mother Nature offers many opportunities to wonder or explore. If you want to treat yourself, try scheduling in a bit of outdoor time into your week. Spending more time outside has been shown to improve mood and reduce depression. 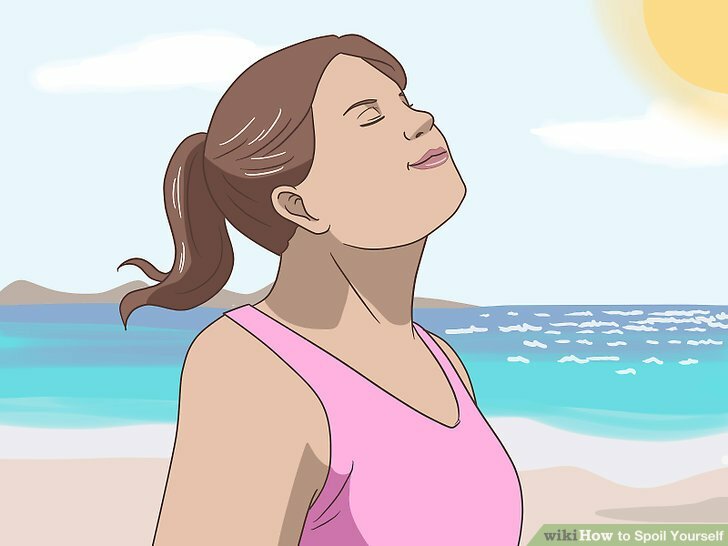 Even if you’re not feeling sad, sitting by a lake, hiking through the woods, or walking along the beach will surely feel like a special treat. 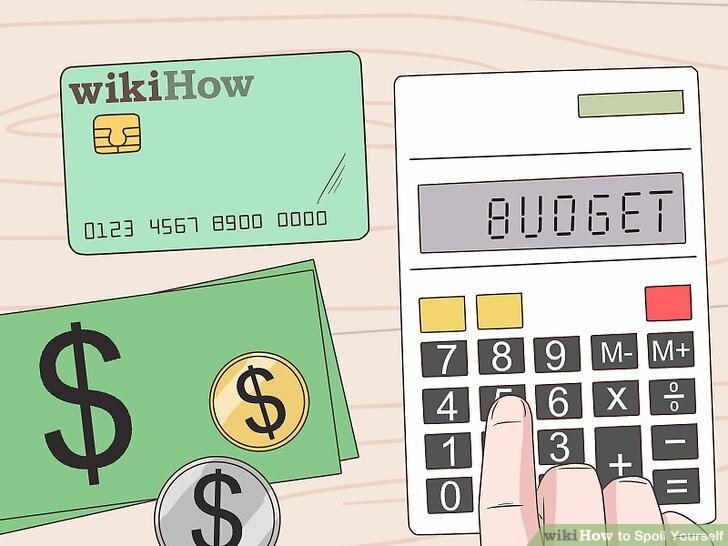 Making indulgent purchases can be a special way to treat yourself, but you’ll need to consult with your budget first. You’ll only feel guilty later if you end up overspending with your purchase. Review your monthly spending to see if you have extra room in your budget for a treat. Even if you only have a small budget, you can still spoil yourself. Cheap ways to do this may include renting a movie from Red Box, buying a one-day pass to a gym, or planning a “staycation” in your own city. 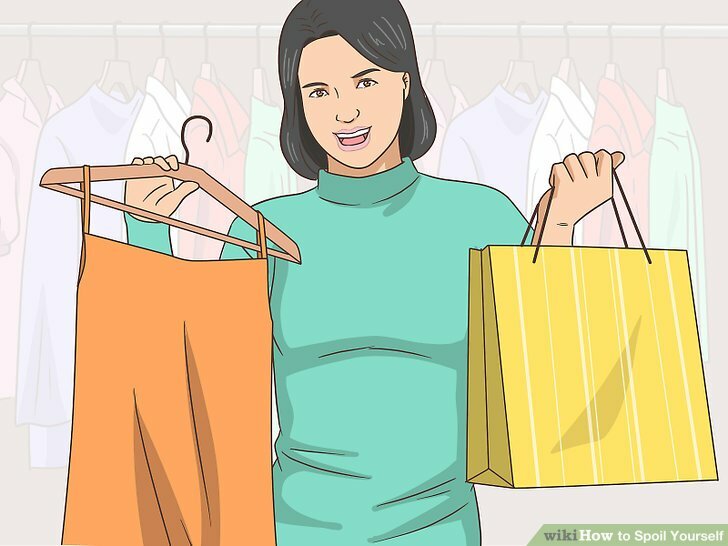 Buy yourself a new outfit. Nothing says “I’m special!” like a new outfit. You know the one you’ve been eyeing at the shop each time you visit but, you refuse to buy it because of the price tag or because you don’t have anywhere to wear it. Go to the store and make the purchase. Then, instead of waiting for a special occasion, make one of your own. Plan a candlelight dinner at home with your partner and wear your new clothes. Or, buy tickets to a concert or other local event. Book a day at the spa or salon. Treat yourself to an afternoon at the spa. Book your favorite treatment, such as a facial, a massage, or a body wrap. You might also make an appointment at your favorite salon. Get your hair colored or cut, or both. Or, get a manicure and pedicure. Remember that new restaurant in town that you have been dying to check out. 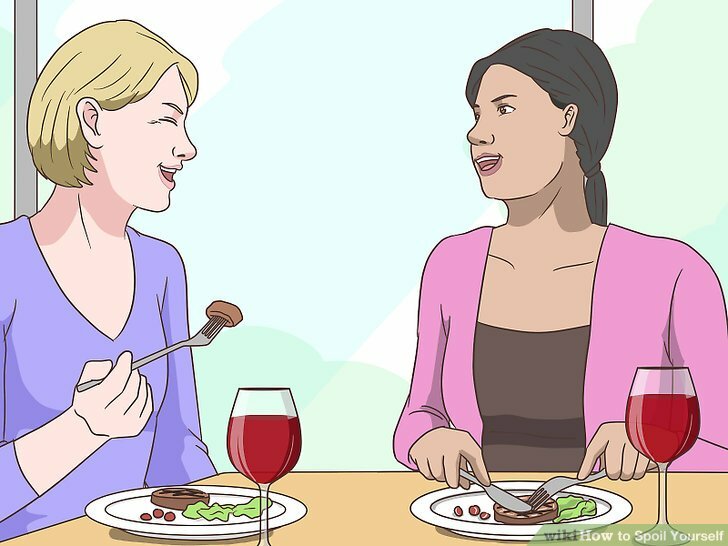 Ask your partner or best friend to join you for a meal. Splurge on the entrée and a dessert. And, if you’re old enough, order some wine to go with your meal. If you’re feeling especially daring, get dressed up and take yourself out for an indulgent meal alone. Travel is a wonderful way to reward yourself or just get away from it all. Save up to visit that exotic location you’ve always wanted to see. Near or far, just make plans to get away. 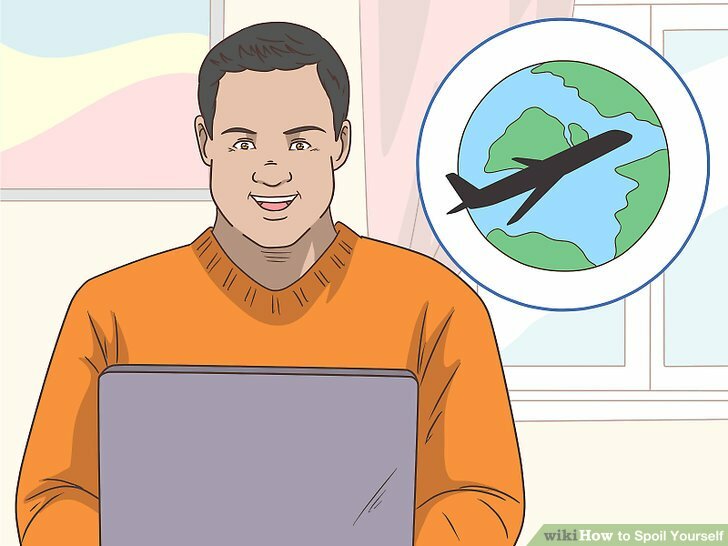 Depending on your preferences and budget, you might want to visit a foreign country or simply sneak away to a nearby city. Add to the excitement by browsing pictures of attractions and hotels online. Map out your top choices and plan your itinerary. Even better, create a countdown on your phone so that you can build up the anticipation.